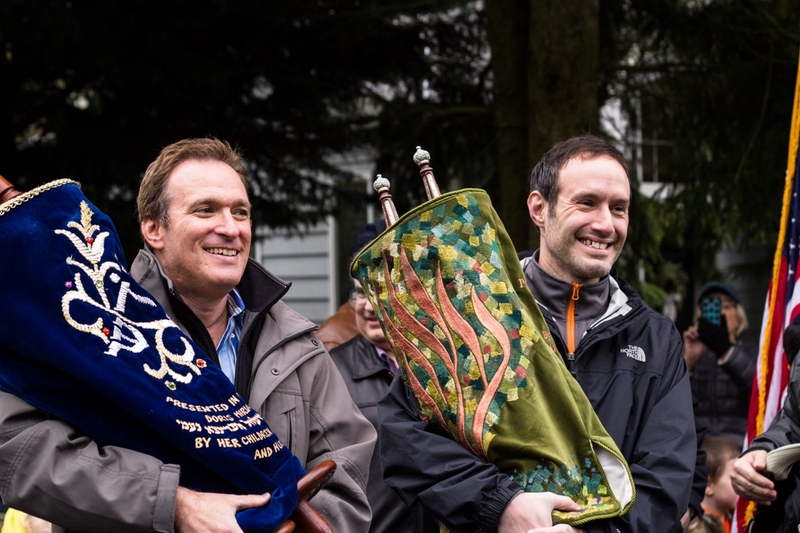 Jon Newman and Aaron Sandorffy parade with Congregation Shevet Achim’s two Torahs to the synagogue’s new home in the former Christian Science Church on Island Crest Way. 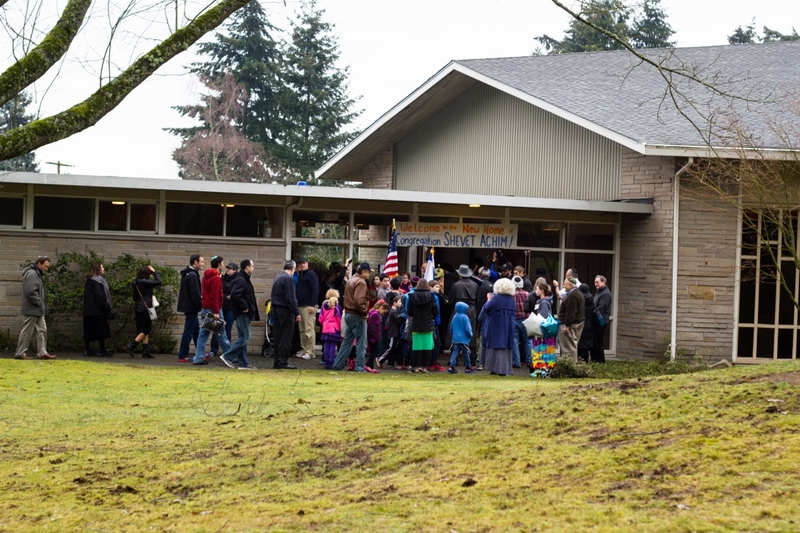 Congregation Shevet Achim, Mercer Island’s Modern Orthodox synagogue, moved into its new home on Sunday, Jan. 11. More than 125 community members gathered at the congregation’s now former location, Northwest Yeshiva High School, to carry their two Torahs – scrolls containing the first five books of the Hebrew Scriptures, which are read aloud and studied throughout the year – from their old location to the new. Members of all ages shared the honor of carrying the scrolls during the nearly half-mile walk to the new synagogue at the corner of Island Crest Way and S.E. 47th Street. “The procession and ceremony were inclusive, joyous, and light-hearted, reflecting the core qualities of Shevet Achim,” said congregant Joel Baskin. After a rousing ribbon-cutting ceremony, Rabbi Yechezkel Kornfeld affixed a mezuzah – a parchment onto which a key biblical passage is written – to the synagogue doorway. He then recited a traditional blessing offering thanks for special occasions. Families streamed into the building for a tour and opening remarks from key leaders involved in the fundraising and move-in efforts. The event featured also featured entertainment for the congregation’s younger members. Congregation Shevet Achim, founded 20 years ago, has grown to more than 90 families with nearly 100 children. “Now we can dream big in our brand new home,” said congregant Malka Donaldo. One of Mercer Island’s oldest and most prominent Christian churches last year sold its property to the synagogue. The sale included the 10,500 square foot building and about three acres of parking spaces and wooded grounds. Church members wanted to see their building remain a place of worship.